Upendra Kushwaha had been targeting the BJP and Nitish Kumar, a key ally of the ruling party, for weeks. 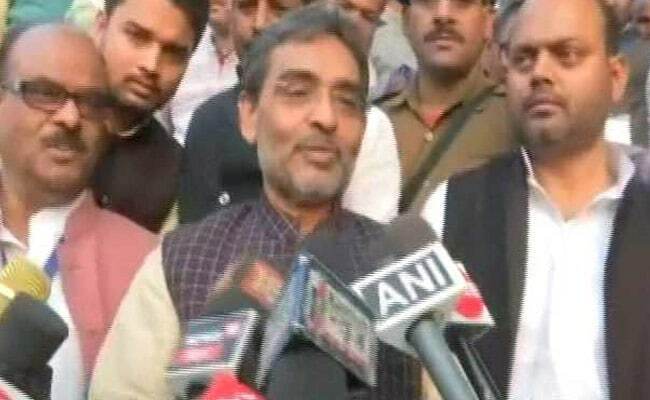 The Congress congratulated Rashtriya Lok Samta Party chief Upendra Kushwaha on Monday after he resigned from the Union council of ministers and walked out of the BJP-led NDA. Mr Kushwaha announced his resignation on Monday saying Prime Minister Narendra Modi failed to fulfil aspirations of the people and he was "dejected" and "betrayed" by his leadership. "Congratulations to Kushwaha ji for telling the truth to the power. Let's build a new Bharat," Congress chief spokesperson Randeep Surjewala tweeted. He said Mr Kushwaha rejected the prime minister and decided to walk out of the NDA as he was distressed by the harassment of farmers, youth, women security and the poor by the BJP and Bihar Chief Minister Nitish Kumar. Mr Kushwaha had been targeting the BJP and Mr Kumar, a key ally of the ruling party, for weeks. He said while he has quit the NDA, his other options are open.